Marga Schlack, 88, of Washington, IL, passed away peacefully Wednesday morning, January 23, 2019 at the Apostolic Christian Home of Eureka. Marga was born in Torun, Poland on March 6, 1930 to Rudolf and Elsa (Albrecht) Steinhagen. She married Oswald Schlack in Germany on March 5, 1955. Oswald preceded her in death on May 22, 2013. She was also preceded in death by her parents and multiple siblings. Surviving is one son, Heinz (Kathleen) Schlack of Washington, one daughter, Heide Schlack of Nashville, TN two grandchildren, Timothy (Katie) Schlack of Washington and Adrienne (Bryan) Wilson of Bloomington, IL; one great grandson, Mason Schlack, and two great granddaughters, Anneliese Schlack and Charlotte Wilson; and a nephew, Curt (Barb) Schlack of Bloomington. In December 1956, with little money in their pockets but great hopes and dreams, Oswald and Marga immigrated to the United States under sponsorship by St. Mark’s Lutheran Church in Washington. In 1965 they were extremely proud to become American citizens. Marga was a dedicated wife, mother, and homemaker. She was a talented cook and knitter and was an excellent student. She was chosen for a special boarding school in Poland before the outbreak of WWII. In the 1970s, Marga decided to pursue her interest in the medical field and obtained her LPN certificate. Doing so also required her to complete a GED since her education records from Germany were not recognized. She then spent 15 years working at what is now Washington Christian Village, always on the night shift. Marga loved to sing. She fondly remembered taking voice lessons and singing in the church choir. She loved the songs “Oh Holy Night”, “Ava Maria”, and “How Great Thou Art” and used to sing a German lullaby that her aunt or mother created. A favorite television show of Marga’s was the “Golden Girls”. 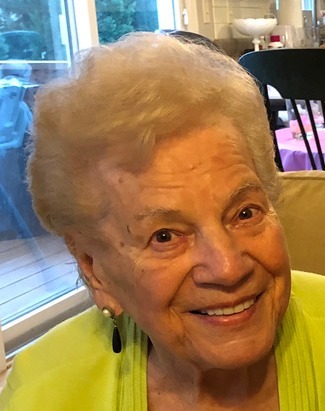 Funeral services for Marga will held 3:00pm on Sunday, January 27, 2019 at Mason-White Funeral Home in Washington. Reverend Thomas L. Heren will officiate. Visitation will be from 2:00pm until 3:00pm Sunday also at the funeral home. Cremation rites will be accorded following her services. Inurnment of her remains will be a later date at Hillcrest Memory Gardens in rural Morton. In lieu of flowers, memorials may be given to her church or to St. Jude Children’s Hospital. To share a memory or send a condolence for her family, visit www.masonfuneralhomes.com.